Consistency is king when it comes to your online art brand, whether it’s your social media channels or your website. You can’t build a following of art fans and potential buyers if people can’t find or recognize you. And, you can’t get those people to stay around if they don’t understand your brand message. 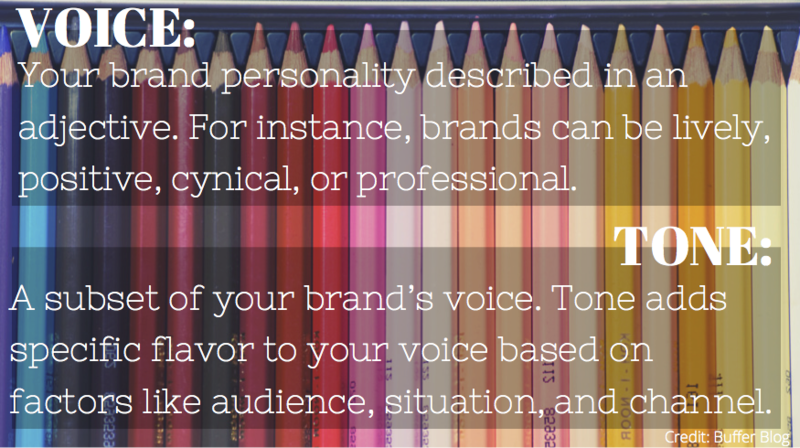 People want to follow an engaging personality with a strong voice and aesthetic they can trust to stay the same. So, are you wearing the crown of consistency? 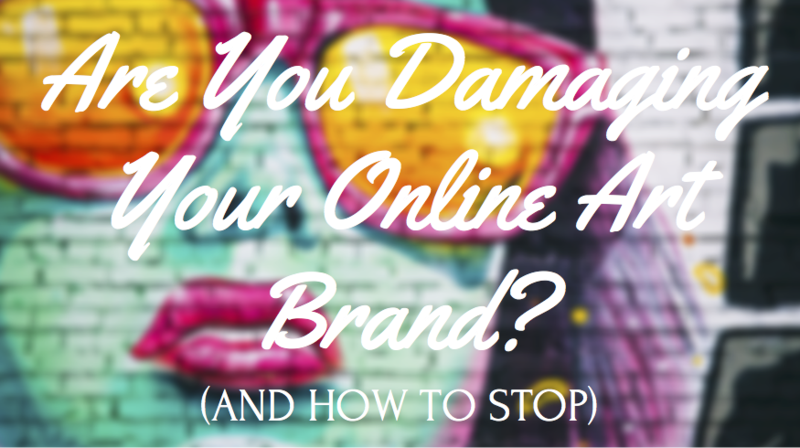 Check to see if you are creating a strong online art brand. It can be difficult to decide on a single profile photo. But, the internet is already a fickle place, so it will only help you to show consistency. Once someone’s formed a preliminary connection on one platform, you’ll want to make sure they can recognize your face on others. Your profile photo becomes a logo of sorts, so make sure it’s everywhere you are - blog comments, your Instagram account, your website, you name it. Kiernan Antares (below) uses a beautiful image of herself in front of her artwork on all her channels. Once you’ve chosen a voice that resonates with your customers, stick to it! You can add variances of tone, but your overall voice needs to stay the same. People follow the artist’s personality, not simply the art. Decide early on what your online personality will be. Will you be quirky or conservative? How about bubbly or introspective? If you’re not sure how to pinpoint your brand voice, read Buffer’s How to Find Your Social Media Marketing Voice: The Best Examples, Questions, and Guides. A consistent artist bio makes it easy for people to recognize and understand the purpose of your art brand across social media channels. 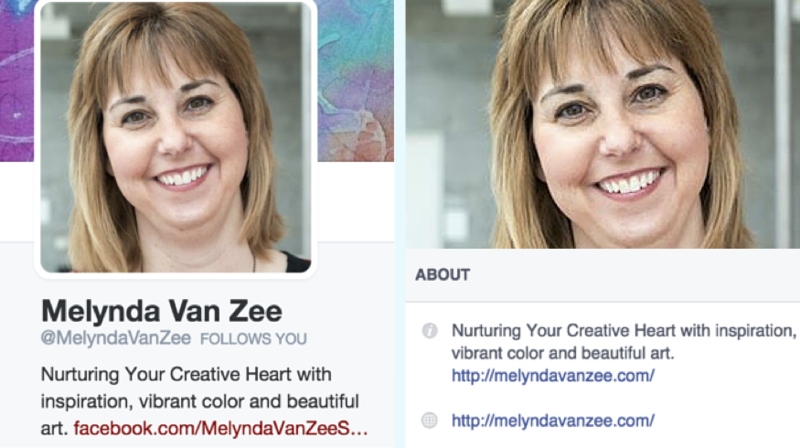 Melynda Van Zee does a wonderful job at this. She is “Nurturing Your Creative Heart with inspiration, vibrant color and beautiful art” no matter where she appears online. You don’t have to have the exact same bio, since some platforms give you a higher character count, but make sure you have the same phrases and voice. This may seem obvious, but you’ll be surprised how many social media handles have absolutely nothing to do with the artist’s brand or name. This hinders Google search results and confuses potential fans and buyers. to give a fictional example, if your name is Rose Painter on your website, your social media handles should be the same or as close as possible (we know names can already be taken). 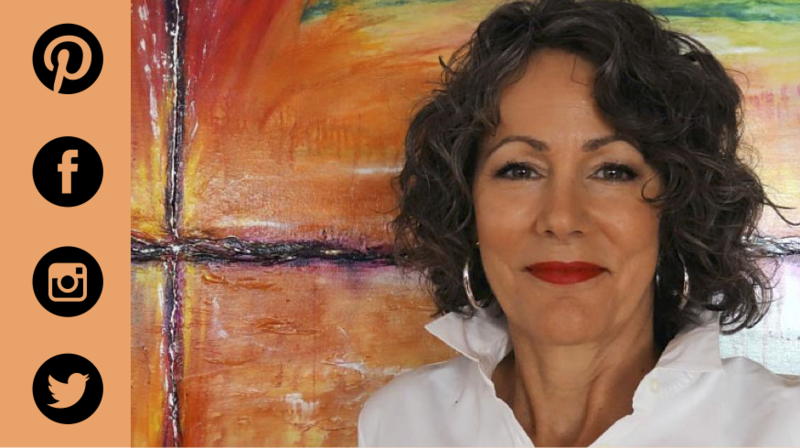 Rose Painter’s social media accounts will be hard for buyers to find if her Twitter is @IPaintFlowers, her Instagram is @FloralArt, and her Facebook is @PaintedBlossoms. Keep it simple, keep it you! Have you noticed what those widely popular social media accounts that you can’t take your eyes off of have in common? They have flawless aesthetic branding. Not only do their words tell a story, but their images and color choices do too. All their images have the same sort of lighting, color palette, and font (if they added text). They’re beautiful to look at and people want to keep scrolling. 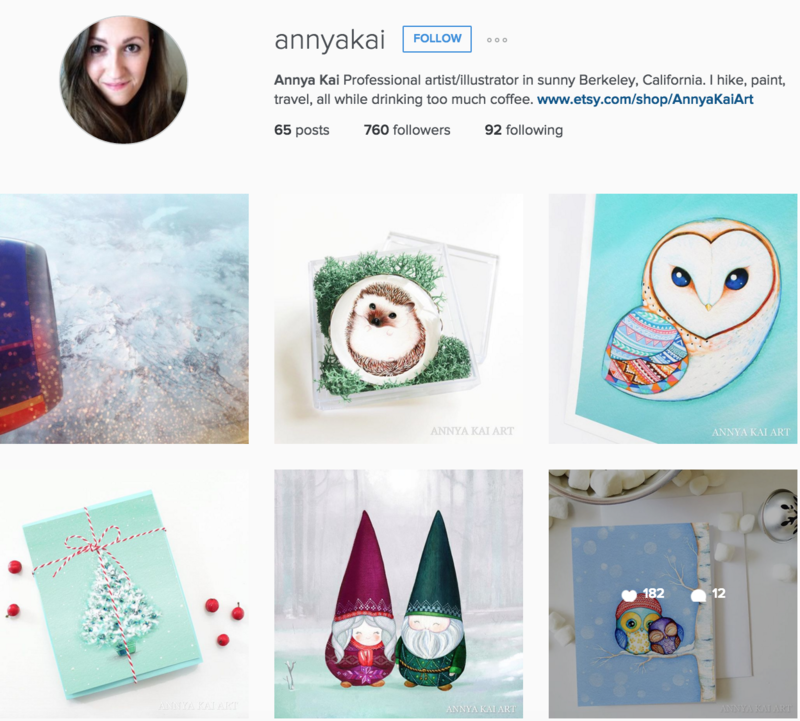 Take a look at Annya Kai’s Instagram and Facebook to see some strong aesthetic branding. Art brand consistency will help art buyers and fans find you and engage with you online. A cohesive art brand looks professional and makes you stand out as a serious artist who took time on their online presence. This can do wonders for your art business. The more people who start to recognize you and your artwork online, the better. Having a few simple systems in place will allow you the freedom to focus your mind on creating and selling your art while in the studio. Do great ideas have to be elusive? Make it easier to have that “aha moment” in the art studio with these 5 tips on harnessing your creativity.